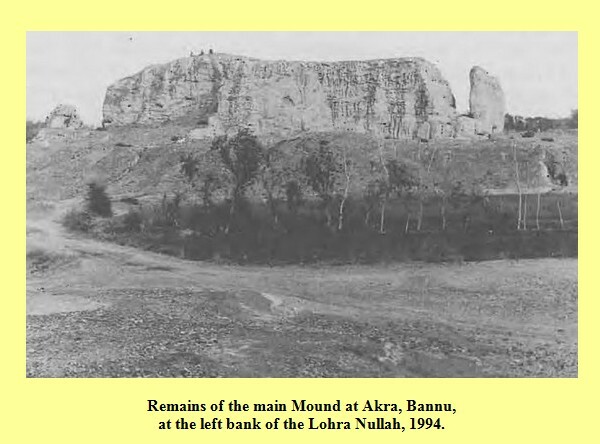 About three thousand years ago there was a city named “ Aakra ” near Bannu. This ancient city was full of life and had its own civilization. People of Bannu believe that due to the sins and misdeeds of the people of Aakra, Almighty ALLAH destroyed the city. It has been said that Almighty ALLAH poured stones instead of water from sky. As a result of this “rain of stones” whole of the city was destroyed. Some say that it was destroyed by volcanic lava. There are others who think that some ancient invader might have looted the city and killed its population. One of them may be true or perhaps all of them untrue. It is the Almighty ALLAH who knows better. The ruins of Aakra are present at a distance of a few kilometers from Bannu in Baraat, a village on 250 feet high hill. They have encircled an area of 133 acre. According to the belief of local Hindus, Baraat was the founder of Aakra, the brother of Ram chandar. But that's wrong Because Ram Chandar and Barat were the inhabitants of UP i.e. Utter Perdeish and Bharat ruled there and returned it to Ram latter on. Some epitaphs, idols, coins and some other antiques are found here sporadically and they are present in various museums of the country even now. From these antiques we can conclude that Aakra was a Greek city. A ting of Greek and Hindu culture exists in these antiques. From these antiques and coins we come to know that either Alexander himself has passed through this city or any of his governors has conquered it. The word Aakra is a Greek word which means a High Place. The place where Aakra is situated is a high hill. The surrounding earth is pretty plain. May be the name Aakra is given to it due to this reason. A great number of baked sticks is found here which shows that those bricks have been used in construction. The age of these bricks is told to be 3000 years old. Besides these, coins containing the names of Hindu Rajas (Princes) and other marks are found here. So all these facts prove that Aakra was a combination of mixed cultures and due the foreign attacks this city was destroyed and devastated. Several antique pieces, coins, and statues found here, are preserved in Lahore museum. Foreign Archaeologists have visited Aakra several times.Prof Farid Khan of Peshawar University in collaboration with foreign experts, has done a lot of research work on Aakra.